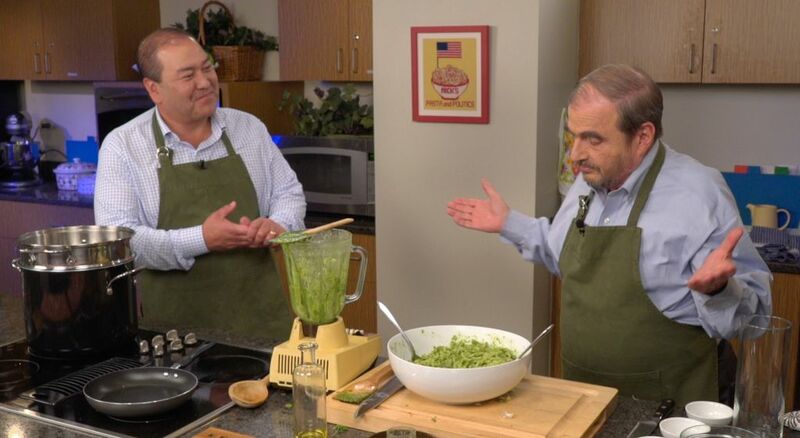 Senator Kevin O’Toole cooks Gemelli with Pesto with host Nick Acocella. On each episode of the NJTV series Pasta & Politics, host Nick Acocella invites a New Jersey political giant into the kitchen to talk politics and cook a meal together. Senator Kevin O’Toole and Acocella prepare gemelli with pesto on the January 4 program. Here’s the make-it-yourself takeaway! Boil the pasta until al dente (firm, not mushy). Toast the pine nuts and the garlic (with the skin on) in a skillet over a medium heat for about two to three minutes until the pine nuts begin to turn gold in color. Remove the skin from the garlic. Put all the ingredients in a blender, food processor, or Cuisinart and pulse until it has the viscosity of a thick soup. Reserve some pasta water to adjust the thickness of the pesto. Fold the pesto into the pasta until it covers all the pasta.